God is telling us today as we read this that he able to deliver us from any fiery furnace we are facing. It was true for Shadrach, Meshach and Abednego and it is true now. Our God does not change. He will not change. Every time I read this story, I am struck by the words ‘But even if he does not’. It’s one thing to put your life on the line if you don’t think you are going to die from it. 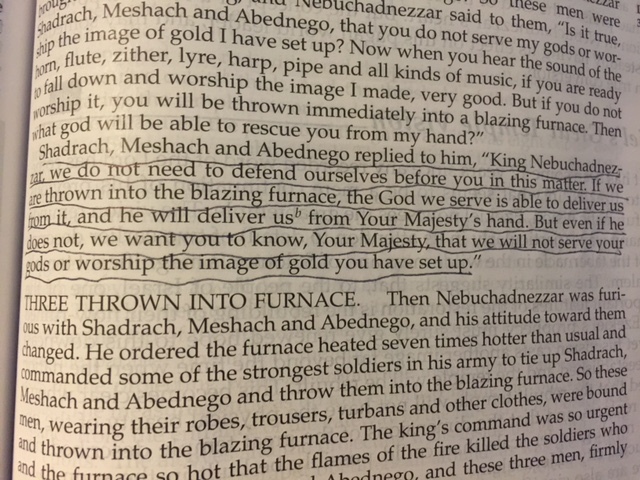 ‘Even if he does not’ meant that Shadrach, Meshach and Abednego were totally trusting God with their lives and their deaths. Either way, they were good. They were committed. They were willing to die rather than to be unfaithful to God. Is our faith that strong? Help us to grow our faith, Abba Father.